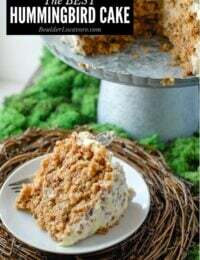 I have a fun holiday treat for you today and one that would make a great unexpected gift too! 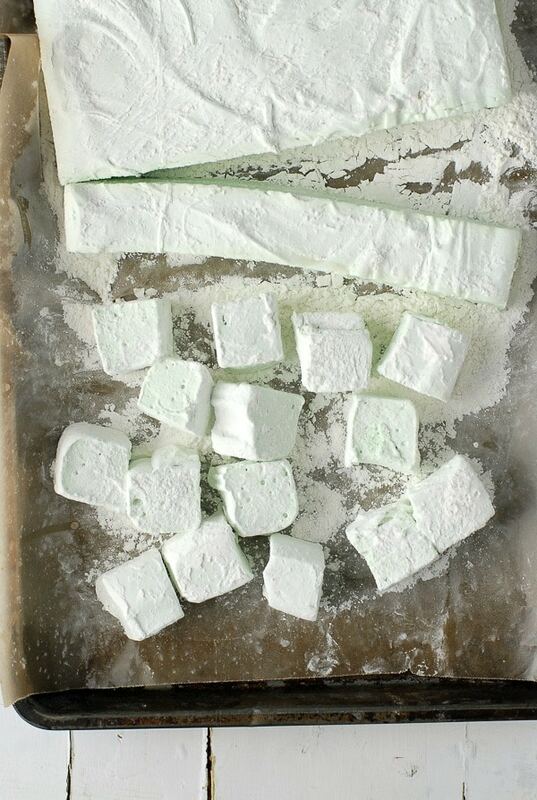 Crème de Menthe Marshmallows. 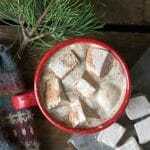 If you look at recipes or food publications on the internet you’ll note and upswing in homemade marshmallows. What’s the point when you can buy them? 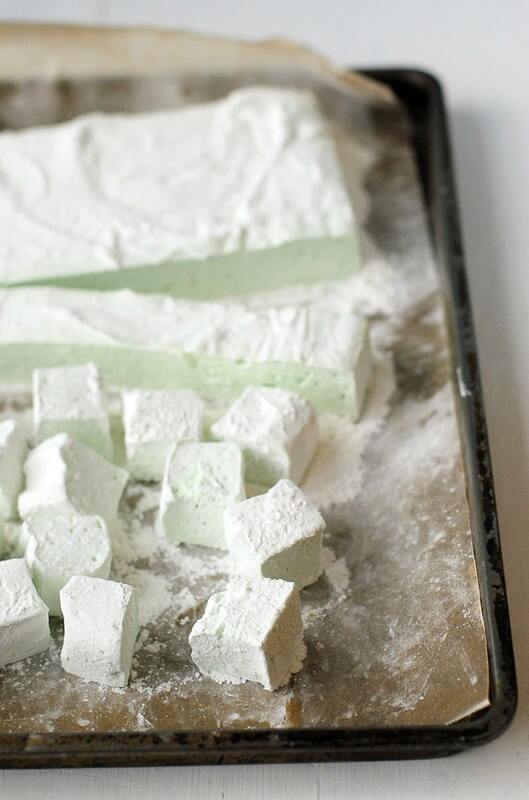 There are several reasons making your own marshmallows is a great thing to do. First you can customize them to almost any flavor you can imagine. Like many homemade foods, they are better homemade. 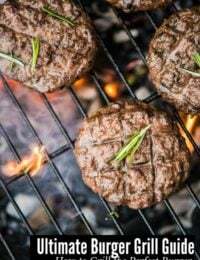 They have a wonderful, whimsical, puffy texture, a great ‘bite’ and flavor. Lastly they are really easy to make. We have been going through a lot of marshmallows in the Boulder Locavore kitchen. It’s definitely hot chocolate season and our pantry hosts a variety of marshmallow flavors. I was pondering a festive batch to make and share, wondering which traditional holiday flavor to feature. 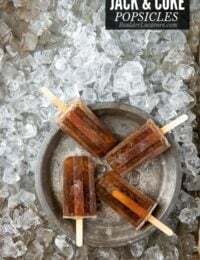 It was actually my teen daughter who piped up with Crème de Menthe; not because I let her drink it but because in our house all dessert paths lead to Grasshopper Pie, the filling of which is made from melted marshmallows, cream and Crème de Menthe. Her rationale was this I could make Crème de Menthe marshmallows then melt them down to make Grasshopper Pie. The kid is always thinking…. To be honest there was no way I was going to part with one of these heavenly marshmallows to a pie once I tasted the first one. 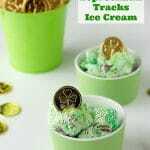 They are lightly flavored with mint and the palest of green color. Perfect for hot chocolate, snowy day S’mores after sledding or skiing, or popping in the mouth solo. One batch makes between 36-49 marshmallows depending on the size when cutting them (I prefer 1 ¼ inch square though 1 ½ inch squares are good for things like S’mores). The marshmallows are best if eaten within 5 days and kept in an airtight container. They would be a very fun gift loaded into a colored Mason jar. Crafting stores now carry multiple colors of the jars giving lots of options. 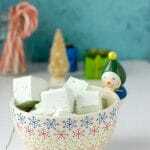 Marshmallows are very easy and fun to make and can be used for many different treats or recipes! 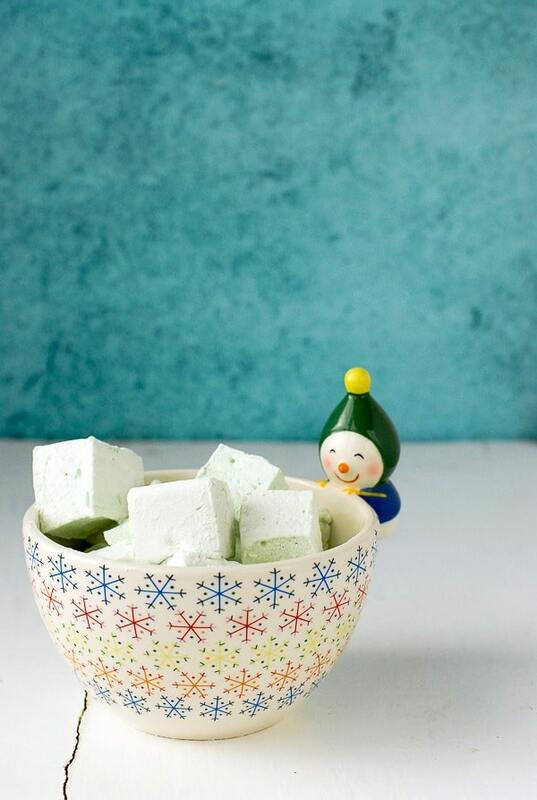 These marshmallows really are for adults since they include Creme de Menthe liqueur. The marshmallows will be a pale green almost light gray in color if not using any coloring. To perk up the green tone a bit, add some food coloring of your choosing when the instructions indicate. 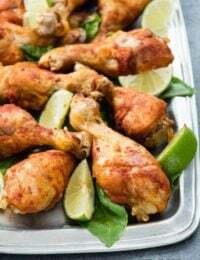 Prepare a 9 by 9 inch square pan by spraying with cooking spray. 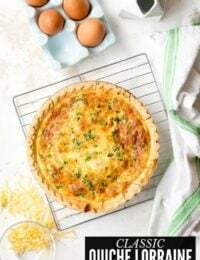 Place a piece of parchment paper in the pan to cover the bottom and two adjacent opposite sides (leaving the other two opposite sides of the pan uncovered) ; press into the creases. This makes it easy to lift out of the pan when done. Spray the parchment paper and set pan aside. Mix together the confectioner's sugar and cornstarch in a small bowl; set aside. In the bowl of a free standing mixer equipped with a whisk attachment, add the gelatin, Crème de Menthe and ¼ cup of the cold water. Do not stir. 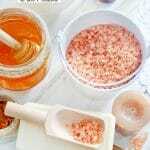 In a large pan combine the sugar, corn syrup and remaining ½ cup of cold water. Stir to dissolve. Equip the pan with a candy thermometer and bring to a simmer over Medium-High heat; do not stir. Allow mixture to simmer until it reaches 240 degrees on the thermometer. Carefully pour the sugar mixture into the bowl of the mixer with the gelatin. Start the mixer on low speed and once the two mixture have combined raise the speed to high and allow to mix for 15 minutes when mixture will be light and airy. At 14 minutes add the peppermint extract and any food coloring if desired (the mixture will be a very pale green without any coloring). Spray a spatula or silicone spoon with cooking spray so it won’t stick to the marshmallow. Spoon the marshmallow mixture out of the mixing bowl and into the prepared pan. Smooth with the sprayed spatula to cover the pan and smooth the top. Sprinkle some of the confectioner's sugar-cornstarch mixture on the top; reserve the rest for the next day. 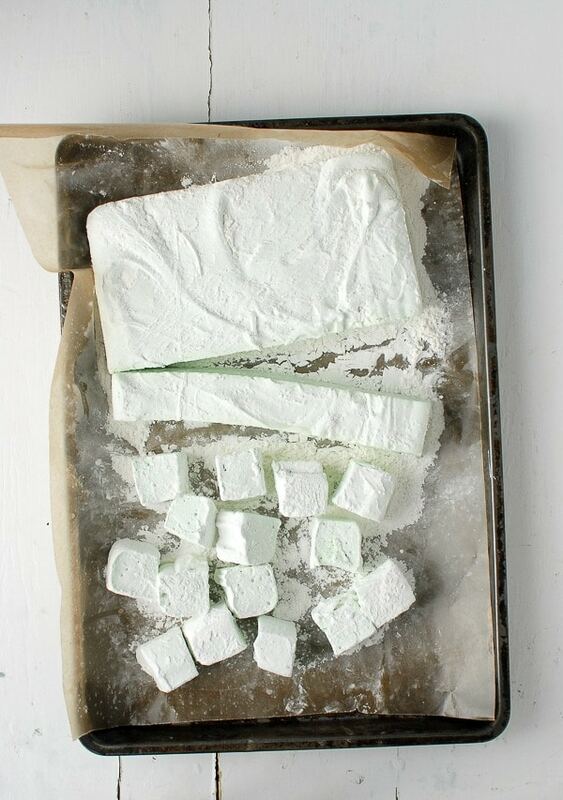 Set the pan of marshmallow aside at room temperature, uncovered, overnight. The next day sprinkle the remaining confectioner's sugar-cornstarch onto a work surface. Lift the marshmallow from the pan with the sides of the parchment paper. Peel away the parchment paper and place the underside of the marshmallow (that was on the parchment paper) onto the sugared work surface, allowing it to become covered with the sugar-cornstarch. Cut the marshmallow into 1 1/4 or 1 1/2 inch wide strips; kitchen scissors work the best for this task. 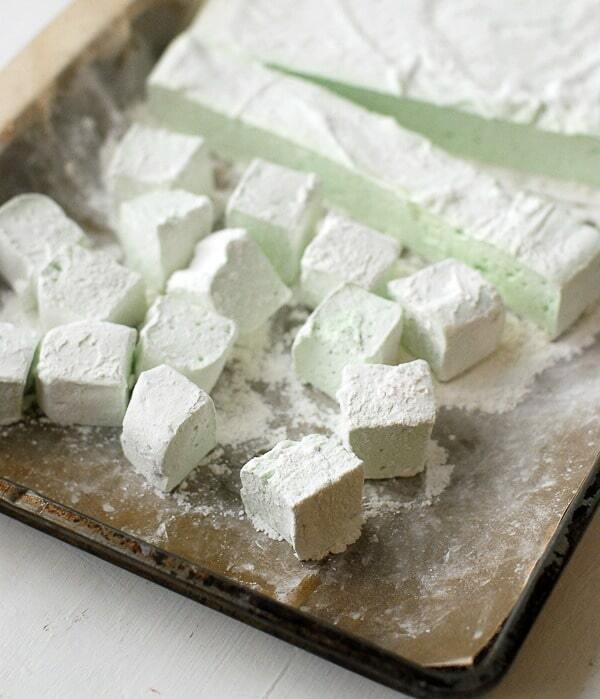 Cut each strip into individual marshmallows (1 1/4 or 1 1/2 inch). 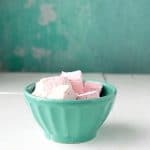 Roll all sides of the marshmallows in the sugar-cornstarch mixture and shake off any excess (this will keep the marshmallows from sticking to each other or hands). 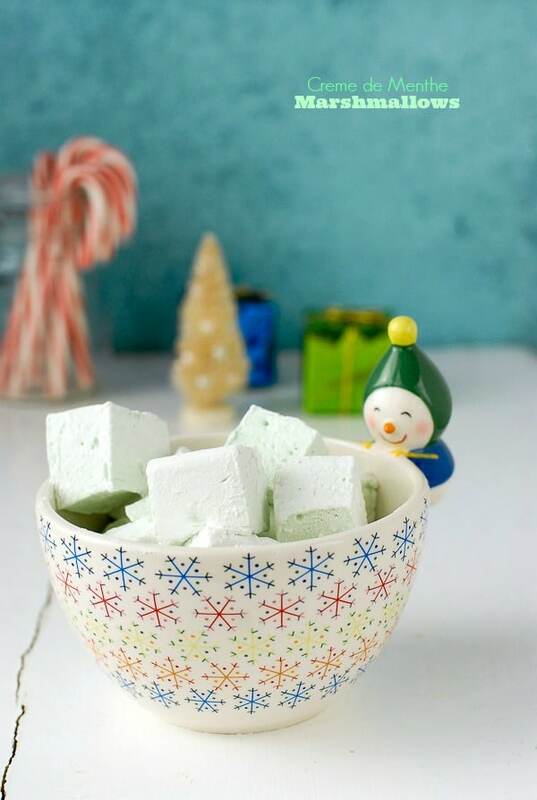 Oh man – I wish I was snuggled up by a fire with a glass of hot cocoa and one of these fluffy creme de menthe marshmallows on top! These look like they’d be a perfect holiday gift too! I’m definitely WAY behind on my marshmallow game. 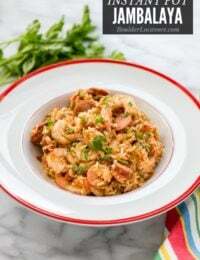 I have yet to make them from scratch but every time I see a recipe for them, I get more inspired. And I’m a mint fan, so these sound totally perfect, especially when dunked into a steaming mug of hot cocoa. OMG these looks so cute and yummy!! I haven’t made mallows in so long! Love the light green color. these are SO fun and festive!! I have been wanting to make marshmallows for a couple of years now and still haven’t done it. Yours look so good. Wish I had time to run into the kitchen to make it right now. omg these would be fabulous in a cup of hot cocoa! OH MY GOSH, THAT BOWL IS SO CUTE! And, I love these Marshmallows! Creme de Menthe is the first thing I ever bought when I turned legal, so it has a special place in my heart! Pinned! You’d love Grasshopper Pie then! I love that you love Creme de Menthe so much Taylor! Thanks for pinning too.